Members and guests of Heysham Chapter No 4108 were most honoured and pleased to welcome Assistant to the Provincial Grand Principals Colin John Rowling, to their installation convocation meeting. Colin was accompanied by fellow grand officers Phil Gardner and Tom Holroyd, together with Lancaster and District Group Vice Chairman Scott Devine. The meeting, held at Morecambe Masonic Hall, was also attended by acting Provincial grand officers Andrew Bartlett, David Tattersall, Peter Pemberton and Chris Larder. Pictured from left to right, are: Brain Warrington, Ken Needham and Ray Griffiths. In what can only be described as a great team effort the ceremony saw Ken Needham installed as first principal, Brian Warrington taking the purple robe of the second principal and Ray Griffiths the blue robe of the third principal. 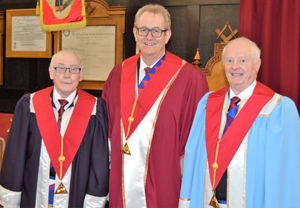 The robe addresses were powerfully and earnestly rendered to the first, second and third principals by Ray Griffiths, Peter Charlton and Keith Dorrington respectively. The address to the principals was presented by John Heaton and the address to the companions, in his own imitable style, by Colin. At the completion of the ceremony, Colin rose to tender the best wishes and congratulations of the Grand Superintendent Tony Harrison, who in Colin’s words, had missed a warm and lovely meeting. Colin added that it was nice to see the address to the companions and the principles, as they are not often undertaken in chapters and quipped that this was obvious, as when they stumbled, no one knew what words to say in terms of prompting. Colin was delighted to accept a number of cheques and notifications of charitable disbursement to the sum of £639.71. Because of donations already submitted to the MCF 2021 Festival, the chapter were awarded with a vice patron certificate, recognising their contributions to the festival. Pictured from left to right, at the presentation of the vice patron certificate, are: Colin Rowling, Brian Warrington, Ken Needham, Ray Griffiths and Simon Hanson (group charity steward). The business of the convocation completed, the companions retired to the festive board, where Colin offered his own congratulations to the principals and officers of the chapter and expressed his delight in the welcome he had received earlier. Colin went on to express his thanks to Phil Gardner and Tom Holroyd for joining him today, as well as the acting Provincial grand officers. He made particular mention of the work the group officers did, much of which went unnoticed. 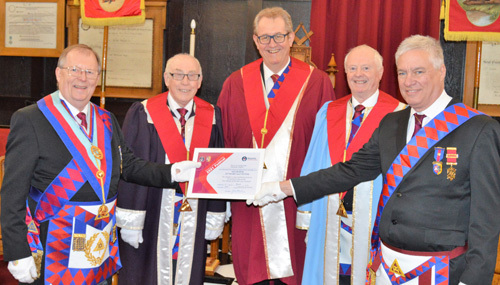 Colin reminded the companions of the need to continue in their efforts to recruit new members to the Royal Arch, as there were still a lot of Craft Masons who had not yet joined. He also discussed the ‘pathway project’ and the on- line learning tool, called Solomon, which is available to all Craft and Royal Arch Masons. The assembled companions were given a final treat, by an inspiring performance of the principals’ song by Fred Fox, with accompaniment from David Tattersall. The enjoyment of the evening was further emphasised by the announcement that the raffle had raised a total of £180, with a further donation of £30 from behind the bar. Pictured from left to right, are: Peter Pemberton, Andrew Bartlett, Phil Gardner, Colin Rowling, Brian Warrington, Ken Needham, Ray Griffiths, Scott Devine and Chris Larder.